Computer crashed four times in a row with the same BSOD. Running Windows 7 Ultimate 64 bit. The crash dumps are not pointing to anything precisely. But it is memory related. Not necessarily the physical RAM, it may be any driver too, passing bad info to the memory. Let us explore both the possibilities. Run memtest86+ for at least 8 consecutive passes. 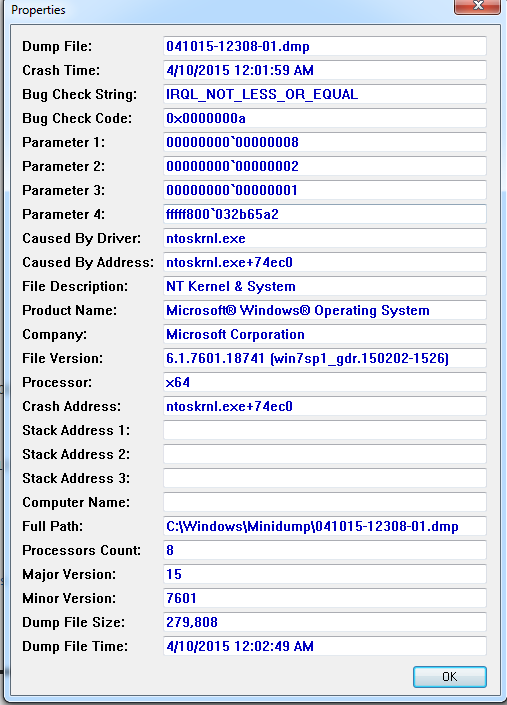 If it does not show any error, enable Driver Verifier to monitor the drivers. Run Driver Verifier for 24 hours or the occurrence of the next crash, whichever is earlier. It puts a stress on the drivers, ans so it makes the unstable drivers crash. Hopefully the driver that crashes is recorded in the memory dump. It will make the system bit of slow, laggy. Before enabling DV, make it sure that you have earlier System restore points made in your computer. You can check it easily by using CCleaner looking at Tools > System Restore. If there is no points, make a System Restore Point manually before enabling DV. If you fail to get on the Desktop because of DV, Boot into Advanced Boot Options > Safe mode. Disable DV there. Now boot normally again, and try following the instruction of enabling DV again. If you cannot boot in Safe mode too, do a System Restore to a point you made earlier. Let us know the results, with the subsequent crash dumps, if any.